Tasmanian researchers have revealed ancient conditions that almost ended life on Earth, using a new technique they developed to hunt for mineral deposits. The first life developed in the ancient oceans around 3.6 billion years ago, but then nothing much happened. Life remained as little more than a layer of slime for a billion years. Suddenly, 550 million years ago, evolution burst back into action – and here we are today. So what was the hold-up during those 'boring billion' years? According to University of Tasmania geologist Professor Ross Large and his international team, the key was a lack of oxygen and nutrient elements, which placed evolution in a precarious position. "During that billion years, oxygen levels declined and the oceans were losing the ingredients needed for life to develop into more complex organisms." By analysing ancient seafloor rocks, Ross and his Australian, Russian, US and Canadian colleagues were able to show that the slowdown in evolution was tightly linked to low levels of oxygen and biologically-important elements in the oceans. "We've looked at thousands of samples of the mineral pyrite in rocks that formed in the ancient oceans. And by measuring the levels of certain trace elements in the pyrite, using a technique developed in our labs, we've found that we can tell an accurate story about how much oxygen and nutrients were around billions of years ago." Their research will be published in the March issue of the journal Earth and Planetary Science Letters. "We were initially looking at oxygen levels in the ancient oceans and atmosphere to understand how mineral deposits form, and where to look for them today. That's a focus of the Centre for Ore Deposit and Exploration Science (CODES), which we established with ARC and industry funding at UTAS in 1989," Ross explains. "But the technology we have developed to find minerals can also tell us much about the evolution of life." After an initial burst of oxygen, the study plots a long decline in oxygen levels during the 'boring billion' years before leaping up about 750-550 million years ago. "We think this recovery of oxygen levels led to a significant increase in trace metals in the ocean and triggered the 'Cambrian explosion of life'. "We will be doing much more with this technology, but it's already becoming clear that there have been many fluctuations in trace metal levels over the millennia and these may help us understand a host of events including the emergence of life, fish, plants and dinosaurs, mass extinctions, and the development of seafloor gold and other ore deposits," says Ross. This fits rather well with other pieces of the puzzle. Pyrite sulfur isotope ratios shows that despite first appearances there were likely little oxygen and large populations of early sulphate reducers in the late Archean. 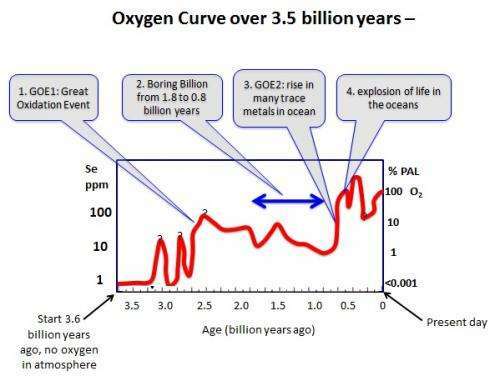 [Pathways for Neoarchean pyrite formation constrained by mass-independent sulfur isotopes, James Farquhar et al, PNAS, 2012] Oxygen may have had small partial pressures up to 10 ppm according to the graph of this paper.